The Mediclinics Speedflow is an extraordinary machine. A stylish, low profile unit, which is one of the fastest and most energy efficient hand dryers on the market. In addition, it is quieter, by half, than the leading brands of high-speed dryers, and up to one third of the price, with the best warranty in its class. High speed hand drying – just 10 to 12 seconds. Up to 4x faster than conventional hand dryers. Reduces electricity usage by 80% over conventional electric hand dryers. Purchase price comes down to 70% less of the leading competitor. Slashes cost per use by 99% compared with paper towels. Slashes maintenance costs associated with paper towels. Long life reduces total cost over time. High quality components, excellent vandal-proofing and the best warranty in its class make the Speedflow a sound investment. Designed to be fitted directly into disabled washrooms without extra building works. Compact size means less space required on floorplan. Conventional footprint, standard fitting holes and universal voltage reduce building costs for refitting and new works. The Speedflow can be fitted in disabled washrooms without any special modification to the walls, unlike most hand dryers. 5 x more energy efficient than conventional electric hand dryers. Up to 20 x more carbon efficient than paper towels (life cycle analysis). Has achieved GREENSPEC listing in the US. Use of renewable electricity sources, reduces environmental impact even more. No waste means no landfill issues e.g. a ten-storey office building can produce over 9 tonnes of paper towel waste per year. Paper towels also imply the consumption of trees, toxic manufacturing emissions, the waste generated by packaging, transport pollution and many other factors associated with manufacture, delivery and waste removal. The total impact of these factors far exceeds those associated with hand dryers. Automatic activation means the user’s hands never contact any surface. Fast hand drying and low noise means more people actually wash their hands. This alone makes a significant improvement in hygiene. On top of this, they leave the washroom with hands that are completely dry, rather than half dry; which is yet another benefit. The Speedflow is around half as noisy as the leading high speed hand dryers. The ability to reduce the speed of the machine can reduce the noise by half again. Special vibration damping, patented inlet scroll design and various other advanced design features combine with high quality components and manufacturing, to create an exceptionally quiet unit. The Speedflow has the best warranty of all high speed machines in Australia. In fact, the Speedflow has a better warranty than most conventional machines. The warranty terms are so good for one reason – quality. We are absolutely confident that these machines, properly maintained, will continue to operate faultlessly way beyond the term of the warranty. Great design, exceptional manufacturing QA processes and quality European components guarantee an exceptional product. Over 25 years of experience in hand dryer manufacture guarantees great vandal proofing. It is one of the primary requirements for any hand dryer. Cover is fixed to base using 2 vandal proof lock-screws, requiring a proprietary wrench to remove. Casing is a very solid, 1.5mm thick steel or stainless steel. Casing design reduces points of ingress and removes any platforms for objects on top e.g. cigarettes or coffee cups. No moving parts external to the unit and a low overall profile make the Speedflow less of a target for vandals. The Speedflow is the only dryer of its type to meet the legal requirements, in the US, for installation in disabled washrooms, without any modifications to the building. The ultra low profile means that the unit only projects 100mm from the wall, significantly removing hazard potential. The casing also has no sharp corners, activation is automatic and the ergonomics of use all combine to make the Speedflow the natural choice for disabled washrooms. Note that accessibility guidelines in Australia’s building codes don’t articulate this requirement in the same amount of detail as the ADA in the US, but the principles remain exactly the same. This unit can be specified for almost any context and it will fit perfectly. Universal voltage: Voltage is set automatically depending on input, meaning this machine can be specified for international projects. Variable fan speed means that the unit can be adapted to different usage contexts. Fan speed can be increased to reduce drying time, or turned down to reduce noise. Variable sensor setting means that the unit can adapt to a large number of contexts. The back panel has universal screw mounting holes, designed to suit most hand dryers, making re-fitting with a Speedflow extremely simple. The wall mounted aspect of the Speedflow (as opposed to floor mounted) means that it will easily replace any other wall mounted unit without re-drafting architectural plans. The sleek modern design, with three designer finishes to choose from, means that it will look good in almost every setting. The compact size and simple, neutral casing means that the Speedflow is even easier to specify. The Speedflow ticks all the boxes. It is a very environmentally friendly hand dryer. 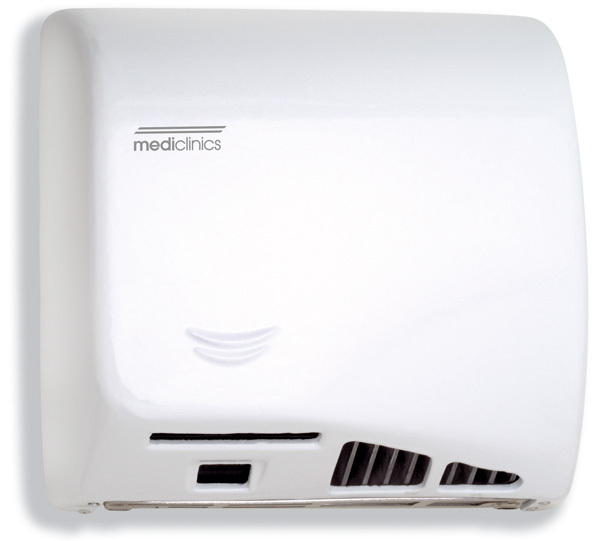 It has the beauty of being a quiet, high efficiency, high speed hand dryer in a conventional, compact wall-mounted format. It is very fast, and produces around half the noise of the leading competitors. It is extremely flexible and has a sleek, yet neutral modern design that makes it easy to specify for a large range of projects. It is the only wall-mounted machine that meets the ADA (US) requirements for disabled washrooms, right out of the box. The Speedflow, above all, is a high quality machine. It is designed and manufactured in Europe to the highest standards, with all components sourced in Europe. Because of this, it has the best warranty in its class. Variable speed to suit a wide range of requirements. Variable sensor settings to suit various situations. Patented air intake scroll: Creates highly efficient air movement. Standard fitting holes: Making upgrades, from other brands, easy. Universal voltage: Automatically selected depending on input. Safety thermal cut-off: Disconnects heating element and automatically resets. Micro-processor monitoring of motor brush wear. Safety timer of 120 seconds. Vibration damping: Highly effective vibration isolating mounting blocks. 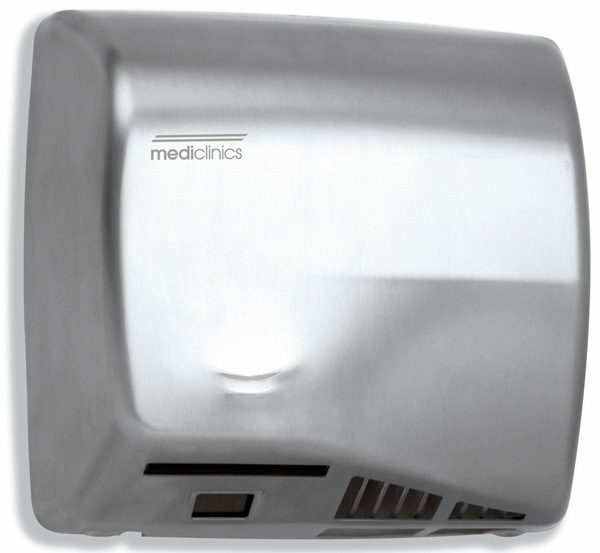 You save money, and trees, every time someone dries their hands with the Mediclinics Speedflow. 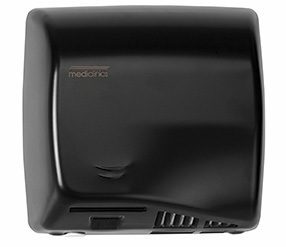 Using 20% of the energy needed by conventional hand dryers and 10% of the total energy required to dry hands with paper towels, the Mediclinics Speedflow is the smart, responsible choice for your washroom.